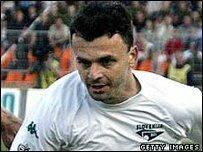 Filekovic has played 14 times for Slovenia. Barnsley boss Mark Robins has signed three defenders on temporary deals. Slovenia international Suad Filekovic, 31, has signed a contract until January, subject to registration and international clearance. Filekovic has 14 caps and has played for NK Maribor and NK Hajduk Split, as well as in Greece, Belgium and Russia. Robins has also brought in two players from Stoke - Carl Dickinson and Ryan Shotton, both on three-month emergency loans, subject to registration. Both players are products of Stoke's youth system and have spent other periods out on loan. What do you think of Barnsley's latest signings? Dickinson, who is 22, has made 60 appearances for City and has had temporary spells at Blackpool and Leeds while 20-year-old Shotton has previously been loaned to Altrincham and Tranmere. Fikelovic initially arrived at the Championship side on trial under former Tykes boss Simon Davey. "He is an international defender who will bring stature and experience to our squad," said manager Mark Robins.